Family businesses are known to have unique competitive advantage over professionally managed firms. Habbershon and Williams (1999) suggest that this competitive advantage is derived from the ‘familiness’ of the business – i.e. a bundle of resources that are distinctive to the firm as a result of the owning family’s involvement. The controlling family’s shared beliefs, practices, policies, philosophies and doctrines are crucial family inputs that shape this ‘familiness’ of the firm. It is the higher degree of convergence on these counts, which enhances goal-congruence and trust among family members. Being ‘together’ is thus conventionally considered a tremendous source of strength for the family and the business. However, all across the world, societies have been undergoing changes and individualism has gained preference over collectivism. Similarly, India too has witnessed socio-economic changes since it adopted the policy of economic liberalisation in 1991. Rapid expansion of the middle class, rising individual aspirations and integration with the global economy has been instrumental to a number of changes in India (figure 1). 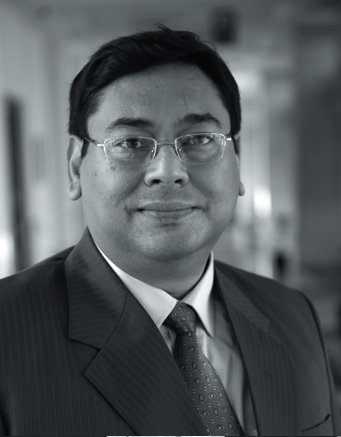 Indian business families have also been influenced by these socio-economic changes. 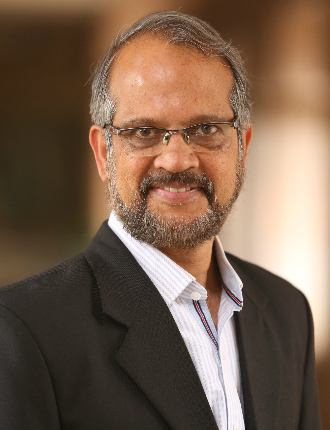 In this context the Thomas Schmidheiny Centre for Family Enterprise at the Indian School of Business found it a worthy research pursuit to explore the meaning and state of family togetherness in Indian family businesses. Some of the questions we attempted to find answers for were – What does togetherness actually mean to family business managers? Are there some underlying patterns or constructs of togetherness? Why do business families that claim to be “together” break up easily? Are family members increasingly asserting themselves even at the cost of “togetherness”? Do they mean different things when they say “we are together”? On which issues do they stand apart? How strongly are they together to take the family and the business forward? A questionnaire survey was conducted among 105 family business members belonging to different generations of same family businesses (Seniors: 36; Juniors: 69). Seniors mostly belonged to 1st or 2nd Generation and were aged 51 years or above, while juniors mostly belonged to 2nd or 3rd Generation and were aged 30 years or below. The survey data was tabulated and statistically analysed to identify distinct patterns of family togetherness. The statistical analysis of survey data revealed three distinct dimensions of togetherness (see Figure 2). Each of these dimensions represented an important facet of togetherness in the context of family business. We found that there are strong familial aspects of togetherness. First, is the emotional bond among family members and respect for family’s culture and tradition. We label this dimension as ‘Familial Togetherness.’ At the next level, there are issues that relate to coming together of family members with regard to business operations. This is where family togetherness pervades into the business domain. Family members come together to make crucial business decisions on strategy and operations. They commonly arrive at mutually accepted norms on sharing responsibilities and rewards. We term this dimension as ‘Economic and Operational Togetherness.’ The third level of togetherness entails unison among family members on matters of succession, inheritance of family wealth, establishment of new ventures and inducting next generation members in business among other long-term strategic issues. We label this dimension as ‘Trans-Generational Togetherness.’ Family members within this core group can be said to be together in the truest sense of the word. The study found distinct peculiarities in family togetherness across each of the three dimensions. i. Familial Togetherness – Families were found strongly bonded together when it came to the familial matters of celebrating festivities or family occasions. They displayed high degree of empathy, caring, cordialness and commitment to well-being towards family members. For instance, 86% of juniors and 81% of seniors agreed that their family had clear and shared commitment to well-being of all family members. Similarly 84% of juniors and 75% of seniors agreed that maintaining cordial family relations was their utmost priority (Figure 3). Similarly on the counts of mutual respect and ethical standards high degree of agreement was witnessed among family members across generations. However, when we transcend from family values to a commonly shared vision, the degree of agreement among family members was seen coming down to a marked extent (figure 4). Though 67% of juniors and 56% of seniors agree that they had clear and shared family values only 45% of juniors and 31% of seniors agreed that they had a clear and shared family business vision (figure 4). Lack of open communication was a major issue that came to the fore and more surprisingly the seniors more candidly accepted that fact as only 31% of them said that their family believed in frank and open sharing of information, opinions and preferences. Though 54% of juniors opined so (figure 5). This comes as a crucial finding as it highlights a critical gap in family togetherness. Yet another factor that threatened family togetherness was the lack of individual space about which majority of the next generation members felt disturbed. Only 29% of juniors felt that they were not constrained by the interference of other family members in their areas of responsibility while half of the seniors thought that this was not the case. It is important that the family businesses realise this problem and work towards providing individual space to the next generation members. ii. Economic and Operational Togetherness – The degree of family togetherness further comes down on issues of business management and operational aspects. Lack of a clearly defined policy framework came as the biggest threat to family togetherness in the business operations domain. Personality driven ad-hoc decision-making creates ambiguity and obscure clarity that may instil a sense of injustice among family members. These in turn create differences among family members. For instance, only 64% of juniors and 56% of seniors agreed that their family business had clear policies for running business operations. Even larger gap in family togetherness was visible when it came to policies with regard to business strategy and direction. Only 57% of juniors and 50% of seniors agreed that they had clear policies with regard to developing business direction/strategy (figure 6). Policy gaps in matters of business operations were found to adversely affect family togetherness. For instance, only 51% of juniors and 47% of seniors agreed that their businesses had policy-based allocation of roles and responsibilities to family members involved in business. Only 43% of juniors and 47% of seniors opined that their businesses had policies for determining rewards to family members for their contribution to business (figure 7). Yet another factor that threatened family togetherness was the lack of individual space about which majority of the next generation members felt disturbed. Only 29% of juniors felt that they were not constrained by the interference of other family members in their areas of responsibility while half of the seniors thought that this was not the case (figure 8). It is important that the family businesses realise this problem and work towards providing individual space to the next generation members though at the same ensuring that they continue to make valuable contribution to the family business. iii. Trans-Generational Togetherness – The degree of togetherness further weakens when it comes to the inter-generational matters of entry of new family members in business, starting new ventures, succession, wealth distribution, retirement and estate planning. For instance, only 48% of juniors and 44% of seniors agreed that their businesses had policies with regard to entry of family members in the business. Only 36% of juniors and 39% of seniors opined that their businesses had clear policies for starting new ventures (figure 9). 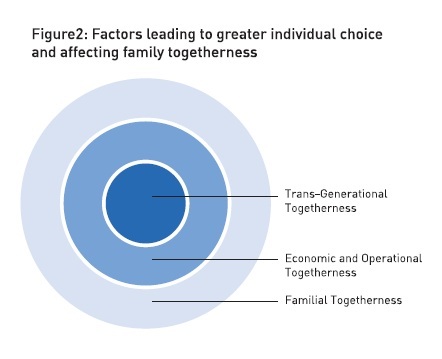 Such crucial gaps in policy framework were critical potential sources of differences and conflicts that did not bode well for family togetherness. Yet another gap that came to the fore was the lack of fair arrangements for spending or sharing of wealth among family members. Only 54% of juniors and 44% seniors opined that they had fair wealth sharing arrangements in their families (figure 10). Another important gap was visible in transitioning of family values to the next generation members and providing them the required guidance. Only 68% of juniors and 56% of seniors thought that their families had clear commitment towards that. Another area where togetherness was challenged was the anticipation of the growth aspirations of the business. 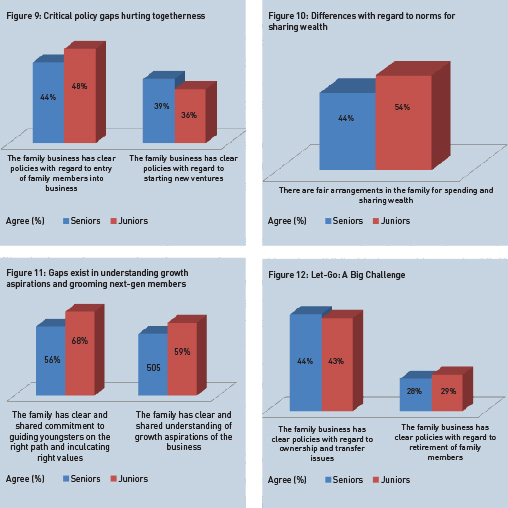 Only 59% of juniors and half of the seniors opined that their families had clear and shared understanding of growth aspirations of business (figure 11). This meant that the families failed to anticipate how the business or the future generation members were eager for growth and this difference in aspirations was a big potential threat to family togetherness. Transfer of ownership and lack of policies for retirement were found to be the issues that seriously threaten family togetherness. For instance, only 43% of juniors and 44% of seniors agreed that their family businesses had clear policies for ownership and transfer issues. Only 29% of juniors and 28% of seniors opined that their businesses had clear retirement policies for family members (figure 12). Thus the reluctance of the senior generation to ‘let-go’ and permitting the next generation to lead the business came up as a major threat to trans-generational family togetherness. These differences do not bode well for the future of the Indian family businesses. The senior generation appears to have a major problem with ‘let-go’ of control over business. There appears a wide gap between the opinions of family members across generations. These gaps are often left un-reconciled, mostly because of lack of open communication channels. In matters of succession, inclusion of newer family members in business or retirement of older members, family members are often seen without any clarity or consensus. There is no policy framework on such issues and therefore differences across generations pose serious potential threat to family togetherness. The senior generation appears to have a major problem with ‘let-go’ of control over business. There appears a wide gap between the opinions of family members across generations. These gaps are often left unreconciled, mostly because of lack of open communication channels. 1. Creation of communication forums/platforms – The root of many of the contentious issues and differences in opinions lies in the lack of communication among family members. The problem is more acute with respect to communication among the members across different generations. Therefore families must establish forums or platforms for open communication where members can freely express their thoughts, opinions and voice out their concerns and differences. Creation of communication forums will also aid in bringing clarity in decision-making process. Regular exchange of ideas will help the family members in bringing the required mindset changes and creating space for each other’s viewpoints. These forums must be made effective by adopting a follow-up and feedback mechanism, so that the members view them as a genuine mechanism that addresses contentious issues. Open and continuous communication will help the family members understand each other’s perspectives, thus minimising the differences among them and strengthening family togetherness. 2. Creating More Opportunities for Interaction among Family Members – Families must ensure that they organise frequent family meets that provide more opportunities to family members to mingle among themselves. This is even more important in case of business families with multiple branches involved in business. Such frequent interactions specially help the members of the next generations or distant members to know each other more closely and understand them. Frequent informal interactions aid in improving empathy, mutual trust and harmony, thereby strengthening family togetherness. 3. Establishment of Family Governance Policies and/or Constitution – The business families need to establish the norms of governance in consultation with all the members. The family governance norms or code of conduct must evolve through discussions and consensus process and must not be forced upon by the dominant coalition in the family. The family may draft and adopt an elaborate constitution that clearly defines the family’s policies on important issues of wealth sharing, norms and qualifications for entry of family members in business, rights, responsibilities and remuneration and rewards of members involved/not-involved in business, retirement and succession plan. This will clarify the rights and duties of all members and will remove any ambiguity in family decision-making. The constitution will help clearly define the family’s vision and mission and set its strategic direction, so that all family members are clear and aligned with the family’s values, vision and objectives. Clear, policy based decision-making will bring a sense of certainty, enhance mutual trust and strengthen the bonding among family members. Family businesses must abandon personality-based, ad-hoc decision-making and evolve a policy-driven decision-making mechanism. Be it the criteria for entry of new family members in business, allocation of roles and responsibilities to family members involved in business or fixing remuneration and reward for family members’ contribution to business – policy-based decision-making will make the system just, transparent and trustworthy. to next-gen members. Such open and rich, goal oriented interactions among family members will strengthen family togetherness. Mechanism – Family businesses must abandon personality-based, ad-hoc decision-making and evolve a policy-driven decision-making mechanism. Be it the criteria for entry of new family members in business, allocation of roles and responsibilities to family members involved in business or fixing remuneration and reward for family members’ contribution to business – policy-based decision-making will make the system just, transparent and trustworthy. The business must therefore lay down clear guidelines and policies for all important areas of decision-making. This will minimise the potential for conflict and bring a sense of fairness, justice and honesty among all. As a result, the interpersonal bonds among family members will be strengthened. 2. Setting up a ‘Family Business Board’ – Family businesses must set up family business boards (FBB) as apex business decision-making bodies with clear guidelines. The family business board will help in aligning business decision-making to the family’s decision-making and optimise the outcome. The FBB can help define the operational domains of family members and can minimise role conflicts and interference. The FBB will help the business in making objective and informed decisions after considering the perspectives of all family members involved in business. It will also help in developing an objective, strategic direction for the business and get clarity about the future of business. These measures are likely to increase cohesion and bring family members together. 3. Job Rotation among Family Members – Family businesses may adopt a policy of rotating the family members through different job positions. This would not only equip them with multiple skills but also help them understand the pressures and requirements of various job roles. After such an experience, they will begin to appreciate the value of the contributions that other family members make to the business. A comprehensive understanding of the entire business process will make the family members better understand the rationale that drives the business decisions of other family members. This will reduce work conflicts and differences among them and strengthen the bonds of togetherness. Family togetherness is a multidimensional and transient concept. Family businesses must not take togetherness to be granted. It needs to be nurtured and familial bonds need to be reinforced overtime. Open and robust communication channels, objective, and policy-based decision-making, supporting family and business governance mechanisms along with a mindset for adaptability are required to strengthen family togetherness. 4. Empowering the Board and Enhancing Business Governance – Family businesses need to build superior governance capabilities at board level. They must induct independent experts on their boards and empower them to hold top management accountable for their decisions. This will improve the standards of business performance; build trust in the business decisions and keep the conduct of all executives (whether family or non-family) under a system of checks and balances. Enhanced governance norms percolating from the top to the bottom will improve clarity and objectivity at all levels and will bring a culture of meritocracy. This will make the entire business process robust and free of favouritism, thus minimising ambiguities. This will improve mutual trust and strengthen the bonding among all family members. In conclusion, family togetherness is a multi-dimensional and transient concept. Family businesses must not take togetherness to be granted. It needs to be nurtured and familial bonds need to be reinforced overtime. Open and robust communication channels, objective and policy-based decision-making, supporting family and business governance mechanisms along with a mindset for adaptability are required to strengthen family togetherness. Family businesses need to establish forums/platforms for family members to voice their concerns and opinions. They need to anticipate the areas where differences exist or may erupt in near future and evolve a transparent policy framework to address them. Transparent, objective, fair and just decision-making mechanisms will bring clarity on matters of business operations, strategic direction and inter-generational issues of wealth sharing and leadership succession. This will minimise the sources of conflicts among family members, strengthen interpersonal bonds among them and contribute to long-term sustenance of family business.